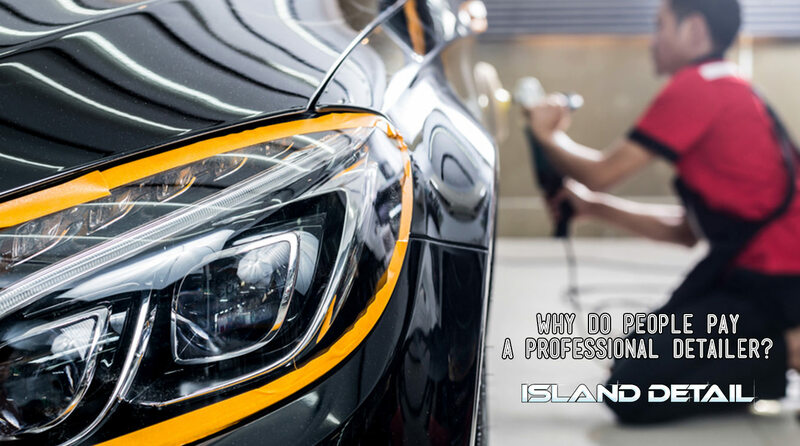 Why do people pay a professional detailer? There are more reasons than you might think. Although a primary reason of automotive detailing is improving the way a vehicle looks, there are many reasons why it makes sense to have your vehicle detailed by a professional. Detailing preserves the value of your automobile while providing the owner with a luxurious driving experience. Cleaning is just the start of a professional detail. Auto detailing provides your car with an extensive cleaning, as-needed restoration, and reconditioning and finishing for both the interior and exterior of the vehicle. The goal of a professional detailer is to restore the vehicle to its original condition. Why can’t I detail my car myself? Although no one loves a car as much as its owner, car owners generally lack the products, equipment, time, or expertise to give their car a professional quality detail. Therefore, it is best to have your vehicle detailed by a professional. Auto detailing can be a dangerous activity, especially for the DIYer. Professionals take various precautions before beginning a detailing job to maximize safety and effectiveness. For example, detailing professionals must make sure they are wearing appropriate clothing and gear to protect themselves from the chemicals they will use while working. In order to avoid injury, a car detailer needs to know the specific hazards of all the chemicals used. To achieve the outstanding results that you expect, car detailers use specialized tools and products. These items, such as compressed air dispensers, electric wax buffers and numerous specialty cleaning products for tires, seals, paint, vinyl, carpets, plastics, and leather, are prohibitively expensive for most car owners to buy themselves. Due to their experience and specialty tools, a professional detailer will be able to detail your car in about a quarter of the time it would take you, and the final product will almost definitely be better. Take advantage of a professional’s experience, and save yourself the headache, by hiring an expert car detailer. Using the wrong product, technique, or tool on a surface of your vehicle could cause serious damage. Experts understand the nuances of how each product and tool will affect a vehicle, meaning that not only will they avoid damaging your vehicle, but can also repair existing damage. The content of the entire article proves this point. A professional detailer has years of experience and training behind them to ensure that they will do a fantastic job. CONTACT US TODAY to set up an appointment for your car, you will be thrilled with the results.